Welcome to Get Found! You've take a big step toward getting your business found online. Once you complete the steps below, your business site will be strongly positioned to rank higher in search results at top sites like Google, Bing and Yelp. 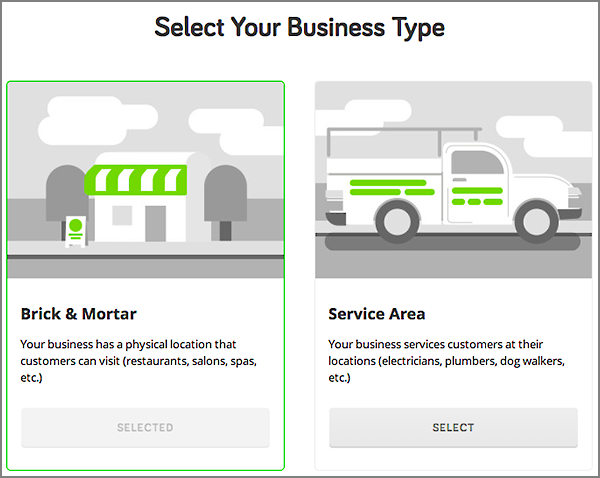 In the Select Your Business Type window, select Brick & Mortar (the default) or Service Area. To understand the difference, see Is My Business Eligible?. 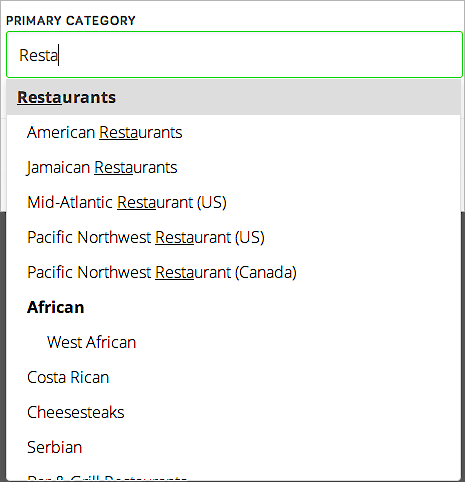 Click Next and Get Found displays business examples based on your choice in Step 3. 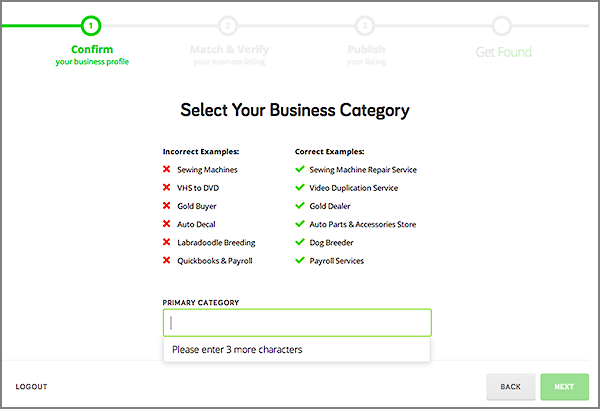 Begin entering a word to describe your business in the Primary Category and Get Found immediately displays likely choices on the fly. To learn more, see Using Get Found's Business Categories. Choose a suggestion from the menu and click Next. 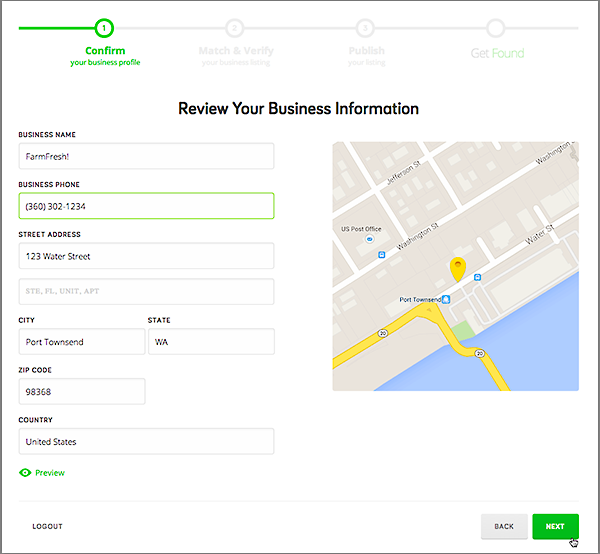 Use the Review Your Business Information window to enter the details of your business, including name, phone and address and click Next. If Get Found cannot validate your address, you'll see this error message: "Oops! We couldn't validate this address. Please verify your address with the USPS database and try again." Make sure you've entered the correct address or see Why my Business Information may be rejected. 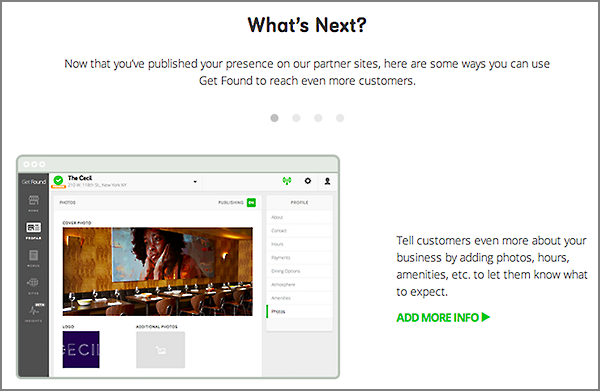 If Get Found matches your business listed with any of our partner sites, it will ask you to verify your business by one of three methods: email, phone or document upload. Click Next and repeat the process until you're done. If Get Found does not find your business listed with any of our partner sites, it will ask you to verify your business by phone. Click Next to continue. Note: To better understand your options, see Verify my business information for Get Found. 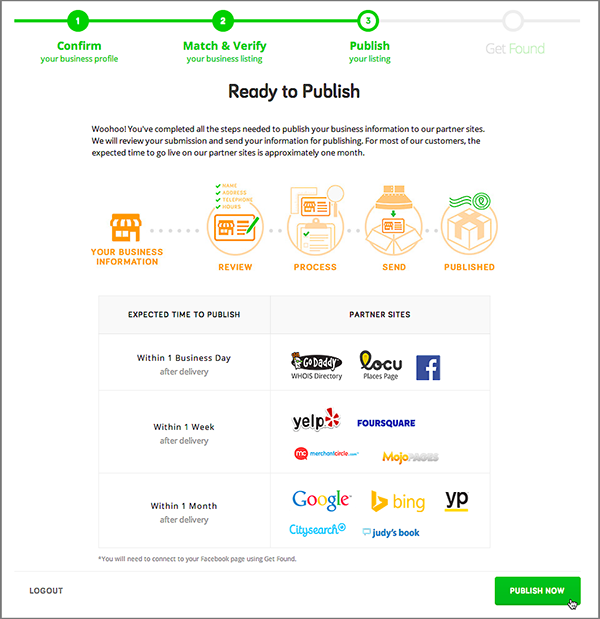 Once Get Found verifies your business, you'll see the Ready to Publish window. Click Publish Now and your updated information will be sent to our partner sites. Note: Before your business is published to our partner listings, your information will be reviewed for quality and may be reformatted to meet our publishing partner guidelines. When Get Found confirms your action, click Next. The first of four What's Next screens highlight other actions you can take: add more info to your profile, add a menu or price list, tweak your page design or check your publish status. To return to the home page, click Skip Tour or click Next to explore the other three What's Next options. Want to boost your business's rank even higher? Consider adding more details to your profile. How to install Font for generic landing pages?